This image shows SW Park Avenue looking north towards SW Yamhill Street in 1964. The Virginia Café and Embers are visible. The area looks very different now. The parking structure is gone. This is now the Simon and Helen Director Park. All structures on the block that had Virginia Cafe and Embers have been torn down. Park Avenue West Tower is under construction in that location. Do you know the name of the building just the other side of the Virginia Café? I believe it is a hotel. I have been searching for a place called The Top Of The Park and I am curious if this might be it. Thanks. @Janet Irwin: Yes, this was one of the Pigeon Hole Parking structures (and probably the closest to the library). There was another shown in this earlier VP post on SW Park and Stark that was moved to SW 9th and Alder. Before my time so I’m not sure if there were others but I bet many people here will remember. From parking garage to parking lot to park (with parking!). Between Director Park and the park next to the First Presbyterian Church at 12th and Alder, I hope future consideration is given to hiding parking structures under ground. Janet, that’s the parking structure that had the elevator to lift the cars. It always looked like it was going to collapse under the weight of the cars. It looked very flimsy because of its aluminum facing but I’m sure under that was a lot of steel girders. As teenagers we used to go to Rod’s Rob ‘n Reel café. It was kitty corner from the garage. There was an sweet older waitress there named Twiggy. Ahh…yes…there WAS one near Park & Stark…always thought it was a “funny” expression: “Park & Stark”…because of the parking lot! It was also a Texaco gas station…well…they advertised and sold Texaco gas. (See Vintage Portland, Sept 2, 2010) As the article states: “It was later moved to 9th & Alder in the mid-sixties.” I’m just having a hard time remember who “ran” the lot…what parking company, because I don’t think it was an independent business…but, I could be totally wrong! It’s the “brand” of gasoline they sold that’s providing that doubt. 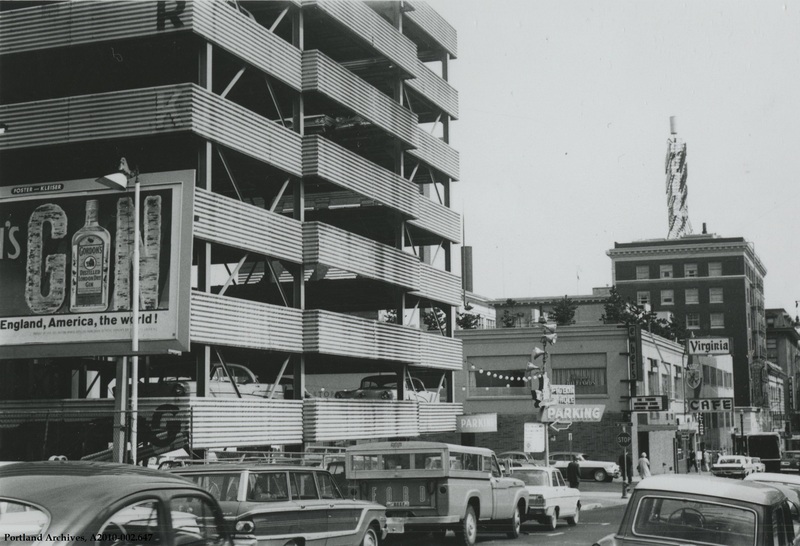 While I can’t remember exactly how many “pigeon-hole” lots there were in downtown Portland, I do know that there were two main “parking companies” that seemed to have the biggest hold on the city back in the mid-sixties to the early seventies. One was CCP…City Center Parking, and their arch rival…APCOA…Airport Parking Company of America. One of their largest structures, APCOA’s, was at the base of SW Broadway…just steps from Burnside, on SW Pine. Their super-large blue and white neon logo’d sign…APCOA…could be seen almost from the foot/the West end, of the Broadway Bridge, all the way up NW Broadway to the intersection of Burnside & Broadway. APCOA was used by The Benson Hotel, as their “parking lot” for their hotel and guests, as well as other hotels in the immediate area…like The Imperial Hotel. Employees of other offices and business also used this enormous structure, (well…we thought it was at the time! ), as well as many other smaller lots in and around downtown. “Monthly Parking” was a form of a bonus for many employees of many downtown business at the time…”You won’t be getting a raise this year, so we’ll substitute “monthly parking” instead!” While CCP…City Center Parking had its hold, APCOA, at least in the mid-sixties to the early seventies, was the largest parking company in the city. And, it had a contract with Chevron…that’s why, as stated above, is the reason I can’t remember who actually “ran” that particular parking structure. APCOA did have a few subsidiaries around downtown, which would have allowed them to sell another “brand” of gas, but that memory is long gone! So, whenever I see that sign, “PARKING” Broadway Garage, I can’t help but think of APCOA! If memory serves me right, the main/original address for the business was 200 SW. Broadway…at least that’s what it said on my paycheck! had the space…so I just thought I’d throw it in, in case it rang any other bells out there! Above the Embers was Wayne’s Billiards, a popular pool hall. I think I remember that in the next 2 blocks down Park Ave. were 2 hotels The Cornelius and the Esquire. I could be wrong about those names. I remember them as pretty bad hotels in the 70’s. Could the Top of the Park have been a lounge in the Park Haviland Hotel (723 SW Salmon)? The Park Haviland name is mentioned in about paragraph 11 of the buildings history. David. I just came across this site and noticed your post about the Park Haviland hotel. Interesting enough i lived in that hotel as a child with my mom and two siblings. My mom worked at a high end woman’s clothing store downtown. We kids loved the indoor swiming pool and our mom loved the roof top bar. Several years ago i stopped in to see it. Sadly the pool bar resturant are all gone. It’s low income apts. It was a great place to live.. walk to all the movie houses on Broadway and a short buss ride to see the Portland beavers play, or oaks amusement park.